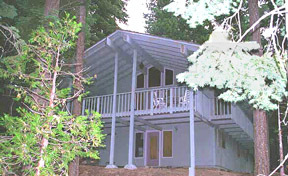 A large 5 bedroom 2 bath home located in a wooded setting in North Lake Tahoe. Close to Tahoe lake, shopping, casinos, bike trails, golf, rock climbing and for winter: skiing, snowboarding. Located between six major ski resorts. Location: Between Kings Beach and Tahoe City on the north shore of Lake Tahoe in the Agate Bay subdivision. Convenient access to the lake, casino, bike trails, golf, river rafting, rock climbing, shopping and ski resorts. Size: This five bedroom, two bath two story vacation home sleeps 12+ persons. Amenities: 2 King size beds. 4 twins. 2 double beds. In addition, there are 2 queen sofa beds in the 5th bedroom (also game room) and in the living room, and 3 portable single beds. Bed linens and towels available. Fireplace, 3 TVs, 1 VCR, 2 DVDs, 2 Stereos, kitchen with plenty of cooking utensils, coffeemaker, microwave, dishwasher, washer / dryer, toaster oven, BBQ, wrap-around deck, ping-pong table, dart board. Parking for 6+ cars (summer). Wireless internet. Agate Bay Sun Club provides a swimming pool, volleyball court, tennis courts and a private pier on the lake. These facilities are located at various areas in the subdivision. Opening schedule is determined at the start of the summer season. Availability: Call for availability and Holiday Rates. NEW!! 3 BEDROOM 2.5 BATH MODERN HOME AVAILABLE FOR VACATION RENTAL STARTING THIS SUMMER.